Curated Content You Care About. Let's change how we interact with our lock screen. Utilizing Microsoft's existing Spotlight hotspots, I designed concepts that leverage the lockscreen to consume content relevant to the user's interests or activity. This is an opportunity to engage customers as a deeper level within the Windows Ecosystem, bringing them useful and valuable information that drive engagement to other Microsoft channels. 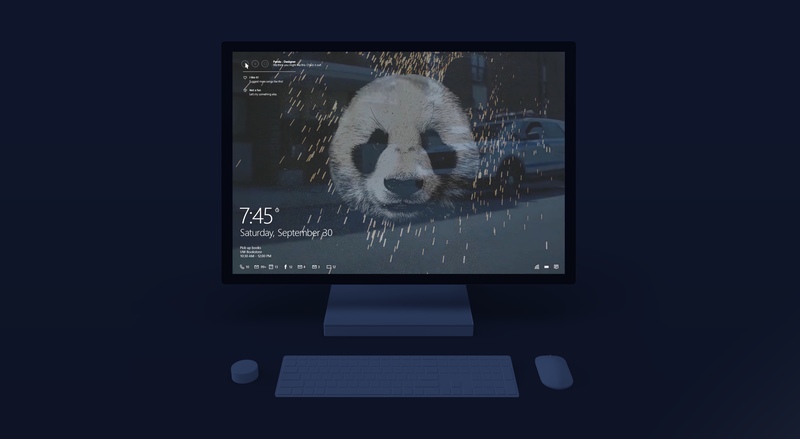 As part of an initiative to get users more engaged in the Windows Ecosystem, Microsoft has introduced a feature on Windows 10's lock screen called "Spotlight". There are context-aware hotspots that allow users to find more about what is on their screen. Currently, Microsoft uses this feature to educate users about potentially unused OS features (pen input, Cortana) or to up-sell applications from the Microsoft Store. The problem is that the hotspots have contributed to banner/ad blindness with the way they have been implemented. Many users seem to dismiss or ignore these hotspots, or turn off the Spotlight feature as a whole because it becomes an irrelevant nuisance. My approach was two-fold. One aspect consisted of rethinking "when" & "what" type of content is shown to the user. 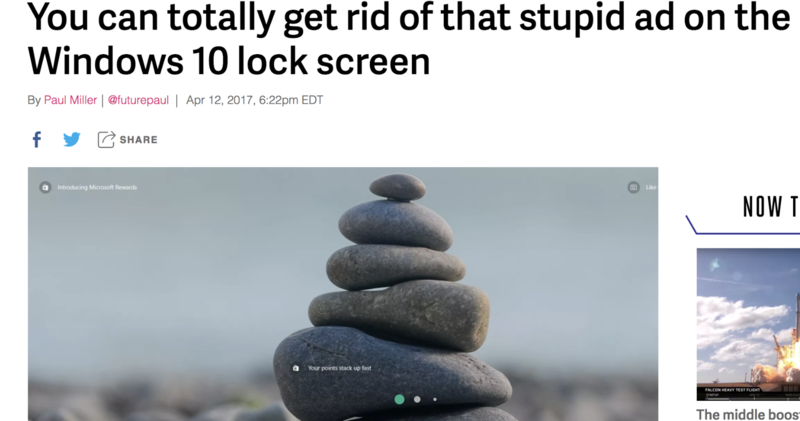 The other aspect is "how" the user consumes the content and "why" they would interact with content in that manner– given the context of a lockscreen. You shouldn't force engagement, but foster natural interest and curiosity to showcase the capabilities and utility of the Windows Ecosystem. Users opening their device, checking the time or notifications at a glance. Instead of showing users clickable content related wallpapers/suggested features, tailor relevant content to foster natural and user-initiated engagement in Microsoft services. When the user opens their device, use location, time, calendar, habits, purchase history, and connected Microsoft services to show content at the most optimal times for the user. Build upon existing feature but execute a bit of restraint – as to not frustrate or annoy the user. Limit hotspots to a singular area. Too many hotspots and notifications can lead to visual clutter and confusion. Don't force engagement. Make things usefully apparent, bringing utility to their fingertips, naturally drive engagement to services/products. The lockscreen in inherently visual. Utilize a full-screen, immersive experience to help drive concentration and engagement through delight. MSN Latest News updates the lockscreen wallpaper with media coverage of breaking news stories covering a recent attack. The user is able to catch-up with different media sources and perspectives covering the subject. The user is then able to click through to Microsoft's news applications/services and follow topics. Throughout the day, they receive the latest news updates at their fingertips about the topic they're following. Through Microsoft's music service, an opportunity to view a new song or album release from a favorite artist can be experienced with the Spotlight feature. This use case can be used for suggestions to discover new music (with an opportunity to up or down-vote to tailor your suggestions) or to view and control current music. If you're currently listening to a song and your computer locks, you can still have a compelling visual experience by playing available music videos. • Help users discover new music and learn more about artist through click-through in Edge Browser. One of the largest use cases is through relevant gaming content through the App Store. Users can save games in a wishlist, sign up for notifications on game release dates, and get gaming suggestions based on previous purchases. In this example, a user has "Rise of the Tomb Raider" suggested because of previous gaming history and new incentives or discounts. They can either click-through to pre-order or be reminded later by Cortana. • Microsoft App Store, connecting wishlists and past purchase data with relevant new suggestions and sales• Seamlessly set reminders through Cortana, putting the burden of remembering information aside. If you'd like to learn more about my design work or inquire about any of the projects mentioned above, don't hesitate to reach out. If you'd like to chat about anything else or perhaps grab a drink, feel free to introduce yourself!